A recent excursion to a local university afforded me the opportunity to access a database I wouldn't normally have access to: the Sunday Times. Reed appears less frequently than you might expect, and mostly late in his career: a few scattered book reviews between 1965 and 1970. ONE of the major traditions in the English departments of American universities is the ritual production, by advanced students, of a PhD thesis. It is a further tradition, only rarely broken with, that the basic subject of the thesis shall be of microscopic dimensions and even smaller importance; the test for the student appears to be how far he can make it stretch, either by irrelevant digression, or by simple repetition. All being well, his thesis is accepted, the PhD achieved. By this time the ex-student has become an obsessional: after a little pause he returns to his subject, and decides that a few extra chapters might not come amiss. He adds not only these, but also a forty-page bibliography consisting largely of books unreferred to in the text, and a three-page preface giving separate thanks to pretty well everyone he has met since the age of five, ending with his wife, whom he refers to in expressions of tender gratitude which must sometimes come as rather a surprise to her. The result is a book. Mr Ford gives us a book. Of the two stretching-methods I have referred to, Mr Ford prefers simple repetition. 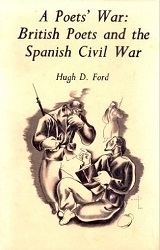 The basic materials he selects are, after all, extremely scanty: two dozen or more inoffensive poems about the Spanish Civil War, few of them with any particular merit, and many by names that have never been seen outside the journals of the time. These writers are of course fairly distinct from each other: all they have in common, apart from their allegiance to the Republicans, is an incapacity for memorable speech. Most of their authors would probably not even bother to own the poems by now. Yet Mr Ford contrives to blur any distinctness that may be discovered in them, by ruthlessly submitting to each and every one of them the same examination paper. He conducts this as a viva voce with no replies allowed except his own: Is such-and-such a poet sacrificing personal sincerity to politics? Is he writing propaganda? Doesn't the reference to so-and-so in stanza two introduce too personal a note if complete identification with Communism is the aim? I can't believe that anyone can possibly care about this. There are roughly 150 pages of it; and the unfortunate poems are up to the neck in it. From the later stages of this morass, which grows denser with repetition, there rise up with an unexpected look of genuine durability about a dozen poems by names well known before the war in Spain. These include Auden's "Spain," which its author has recently described in print as "trash," half a dozen well-controlled poems by Spender, a few pages of deceptively casual vividness by MacNeice, three or four lyrics by Herbert Read, and Day Lewis's narrative poem "The Nabara." These poems, and possibly a few others, have survived the epoch in which they were written, and this, I gather, Mr Ford, after much cautious mumbling and bumbling, concedes. Some of them—Spender's subdued elegies, for examples—seem in some odd way better than they did when they first appeared. There seems no point in re-inserting any of these distinguished works into their historical context; just as, in reverse, there seems no longer any point in isolating the Spanish War from the years of ever-spreading Fascism that led to it, and the world war which Franco's success perhaps made inevitable. To those who followed its fortunes, the Spanish War had a particularly sharp and saddening taste, which we may on occasion suddenly recall: a true imaginative and creative gesture might still be made from memory of it. But on the subject of the gestures made at the time, half a dozen succinct pages should by now be enough. Robin Skelton reports that W.H. Auden referred to his own Spanish Civil War poems as 'trash' in the preface to Poetry of the Thirties (Harmondsworth, England: Penguin, 1964). This issue of the Sunday Times also contains a review of Vincent Brome's The International Brigades: Spain 1936-1939, by Stephen Spender. While I was tracking down two references to book reviews Henry Reed had written for The Sunday Times, I unexpectedly discovered this critique of The Complete Poems of Walter de la Mare (Faber and Faber, 1969), "Solacing Music," from January 25, 1970. In a happy coincidence, it happened to appear in the first month of the first of many, many reels of microfilm I was whizzing through. This particular review is especially interesting because not only does it outline Reed's personal feelings about de la Mare's poetry, but it also lets slip two personal anecdotes. The first is related to Reed's shared affinity for, and indebtedness to, Thomas Hardy and his poetry. Reed mentions having visited Hardy's second wife in 1936. Indeed, Florence Hardy wrote to Reed in December of that year, in an attempt to dispell his delusions about penning a biography of her late husband. Reed goes on to describe his only meeting with de la Mare, which occurred 'after some rather fractious gathering convened to decide which verses in our language might not be too tedious or indecent for the young ears of the Royal Family.' This being in reference to a poetry recital which was held at Wigmore Hall in May of 1946 in honor of the Queen, Princesses Elizabeth, and Princess Margaret. Incidentally, it was the meetings for this poetry reading which would inadvertently cause Vita Sackville-West to swear she would never write poetry, again (more on that, later)! He could no longer listen to the reading of prose, though a short poem now and again interested him. In the middle of one night he asked his wife to read aloud to him "The Listeners," by Walter de la Mare. I have never, myself, wanted to know who the traveller or the listeners are in this poem, and have rather averted the gaze from any exegesis of it. But is this not in itself rather a despicable critical evasion of a kind which we have resigned ourselves to in the case of de la Mare? Let me revert to Hardy. Though Hardy was kindly and hospitable to the many young poets who sought him out, de la Mare was the only one he was genuinely curious to meet. I am sorry I cannot "document" this statement: it was either told me by the second Mrs Hardy in 1936, or it is remarked on in one of the several thousand unpublished Hardy letters now being edited by Professor Purdy. The deliberate touch of pastiche in these lines, written round about 1938, is of course a kind of homage and does not make the poem less moving. It is very different from the real help he had sought from Hardy's poetry in 1921, or just before when, as Dr Leavis has acutely remarked, de la Mare seems to have recognised "the vanity of his poetic evasions . . . It is as if, in his straights, he had gone for help to the poet most unlike himself, strong where he is weak" [New Bearings in English Poetry. London: Chatto & Windus, 1950]. It is doubtful if he found this help. For some reason, after the publication of "The Veil" in 1921, de la Mare stopped publishing serious poetry (at least in England) and devoted himself to prose, and to comic verse. When I was an undergraduate, on the rare occasions when twentieth-century poetry was admitted to exist, de la Mare was occasionally mentioned, sadly withal, as one who had not fulfilled his promise. This was quite agreeable to us: it meant we did not have to go and find out exactly what the promise had been. In any case we had, by then, Eliot and Pound, and they provided quite enough matter for thought, if thought was what it was we directed at them. There was, however, a genuine feeling that de la Mare had ceased to exist. Then, in 1933, appeared "The Fleeting." But by this time we had Auden to cope with. And "The Fleeting" was much the same mixture as before, though longer poems like "The Owl," and "Dreams" (which mentions, not with much respect, the Id) had begun to appear and to threaten a boredom later to display itself more expansively. Other volumes, light or serious, followed. Towards the end there were efforts at the long "great" poem. "The Traveller" is often exciting and terrifying, but only in its last pages really impressive. As for "Winged Chariot," I have to confess to what may be a personal blackout. It is a long poem about time, chronometers, etc., and is often in its early pages humorous and engaging; the trouble is that though it is at no point unbeautiful, it is largely unreadable. I am pedantic enough to wonder why the charming marginal glosses (like those of Hakluyt and Coleridge) of its first edition should have been inserted in this Collected Poems into the poem itself as though they were epigraphs to various sections of itthereby rendering what is difficult enough virtually unintelligible. Mr Auden does the same with it in his "Choice of de la Mare's Verse" and tells us, a little uneasily, that the poem "is better read, perhaps, like 'In Memoriam,' as a series of lyrics with a metre and theme in common." But surely for God's sake please, Tennyson's poem is a moving poem? We don't come out of it quite as we went into it; and we do not fall asleep during it. In 1913, reviewing a "collected" Robert Bridges, de la Mare remarks: "The writing of verse easily becomes a dangerous habit." This is distressingly true of himself: there is simply and blankly and monotonously too much of him. In the same essay, he remarks: "Complete editions serve too often merely for an imposing monument" ["The Poetry of Robert Bridges." Review of The Poetical Works of Robert Bridges, Excluding the Eight Dramas. Saturday Westminster Gazette, August 30, 1913. Reprinted in Private View. London: Faber and Faber, 1953. 108-113.]. In the present volume his poems occupy, in fairly small print, pages 3 to 888. This is a lot of reading-matter. I cannot think its gentle author can have wished it all at once upon anybody. FLAWLESSLY and confidently though he himself can write, Mr Cooke does not hesitate, in this fine book, to withdraw himself when necessary, and with excellent judgment to let his subjectsfor there is Helen Thomas as well as Edwardhave their own say: as they both eloquently could. And since Thomas and is wife, despite difficult passages, were never enemies, Mr Cooke's book moves the reader in a way that biography rarely does: his second chapter, "The Divided Self," is a model of well-selected documents, in both poetry and prose, brought together, properly digested, and firmly handled. He has, of course, a subject where, biographically at least, there seems little need for guesswork. Thomas himself was a self-declared depressive, often took laudanum, and was on occasion determined on suicide. Mr Cooke is fully aware of the justifiable self-pity of both Edward and Helen. It is balanced by their pity for each other and their candid understanding and acceptance of each other. Certainly Thomas himself, through the whole of his fantastically overworked life as a hack journalist and a writer of "deadline" commissioned books, gives the impression of someone who could not easily tell lies, and the well-known portrait of him (a trifle blurred in this volume) gives the feeling of someone who could not easily believe in them either. Can I love you at all. 3 December "Up in the Wind"
7 December "The Sign Post"
And these poems are by no means dilettante haiku. Some are of notable length. It is to be hoped that the elegant pages of the Collected Poems may as a result of Mr Cooke's researches, soon be rearranged chronologically. Thomas's switch to poetry (much of it, and some senses all of it, remarkable: it had the rare distinction of never appearing in "Edward Marsh's "Georgian" collections) has been variously explained, Robert Frost, older, but not much older, and first published in England, had said to him: "You are a poet or you are nothing." But a man does not became a poet simply because he is told he is one; though doubtless Frost's remark struck at something Thomas had wanted to, yet dared not, until then, think of. Suddenly, at Arras, you possessed that hinted land. You can read more about Edward Thomas on the Friends of the Dymock Poets website.